The Automatic Sleeper Relaying Beam has been specifically designed and purpose-built for operations in the UK. 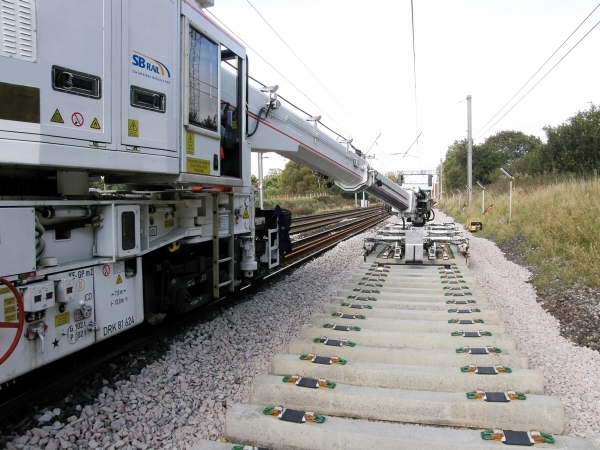 The beam is enabled by SB Rail’s unique Robot Arm and is able to pick up sleepers from wagons, automatically space and lay them with precision up to 28 at a time. During the lift and delivery cycle a fully automated program spaces sleepers to 600 or 650mm centres with an accuracy of ±2 millimetres. Once placed, a laser alignment target positioned on the previously laid section allows the operator to align the next set of sleepers to within ± 3 millimetres of final alignment. Depending on site conditions, freight haulage arrangements and other equipment in support of the works, it is possible to lay up to 16 sections of 28 sleepers per hour. Unique to the KRC 250 and the Automatic Sleeper Relaying Beam is the ability of the crane operator to control load attachment, movement, spacing, alignment and placing without additional site operatives. This genuine single-man operation eliminates the need for semi-skilled staff on-site and reduces site operatives to a minimum in support of ancillary activities.